Designed by Lotte Tile - Cat is a great looking tile for inside. This cheerful tile can be hung on your wall and is made of ceramic. It features a text saying 'All you need is love and a cat'. This Tile by Designed by Lotte fits in every interior! 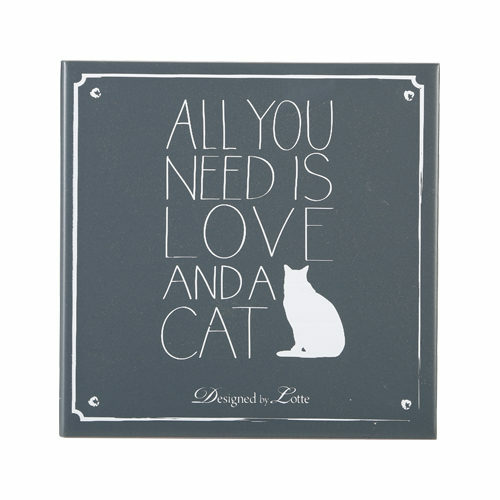 This beautiful, grey wall tile is perfect for loving cat owners. It is made of ceramic and features the funny saying: All you need is love and a cat. Something cat owners undoubtedly agree with! Have you used Designed by Lotte Tile - Cat before? Let us know what you think about this product.